Origin and Habitat: Mexico, This species is widely distributed as a large number of small, isolated populations in a big area extending over 600 km, from central Coahuila in the north to Queretaro in the south, and the species is also found in the states of Coahuila, Nuevo León, Querétaro, San Luis Potosí, Tamaulipas, and Zacatecas (its extent of occurrence is about 60,000 km²) and has a very large population (ca 100,000 mature individuals). 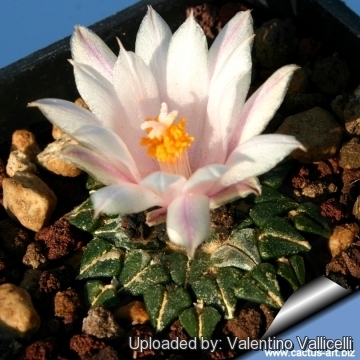 Altitude: It grows at elevations of around 1000-1900 metres. 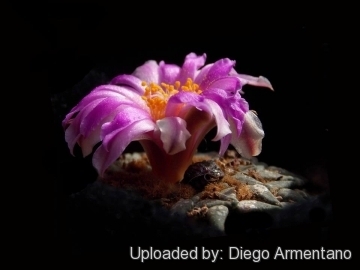 Habitat: Commonly called "living rocks," they are edaphic specialist plants widely distributed in and around the edges of the Chihuahuan Desert (The habitat is locally classified as matorral desértico micrófilo and mezquital extradesértico). They are scattered in a large number of small, isolated populations, generally on limestone derived gypsum silt plains and on hills. The area where they grow must be quite wet during the rainy season (Summer). Some of these areas become flooded periodically during the summer rainy season. 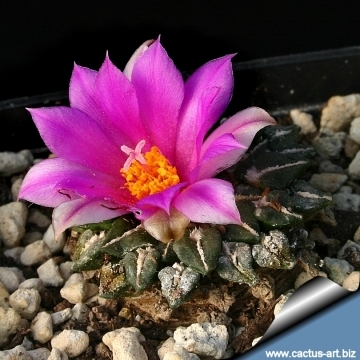 In the same area it is possible to find several plant species like: Dasylirium longissimus, Thelocactus bicolor, Mammillaria echinata, Agave stricta, Lophophora williamsii, Glandulicactus uncinatus, and Wilcoxia schmollii. 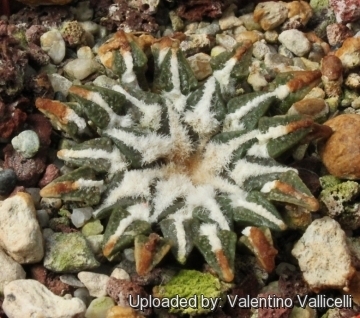 Ecology: This plants are extremely cryptic and are very difficult to spot as they blend in well with the terrain around them resembling dried mud. 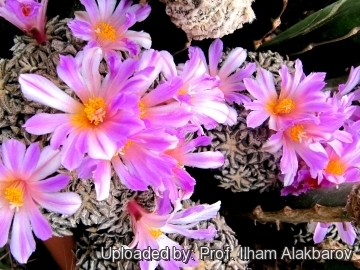 When they are found, it is usually due to their pinkish flowers. 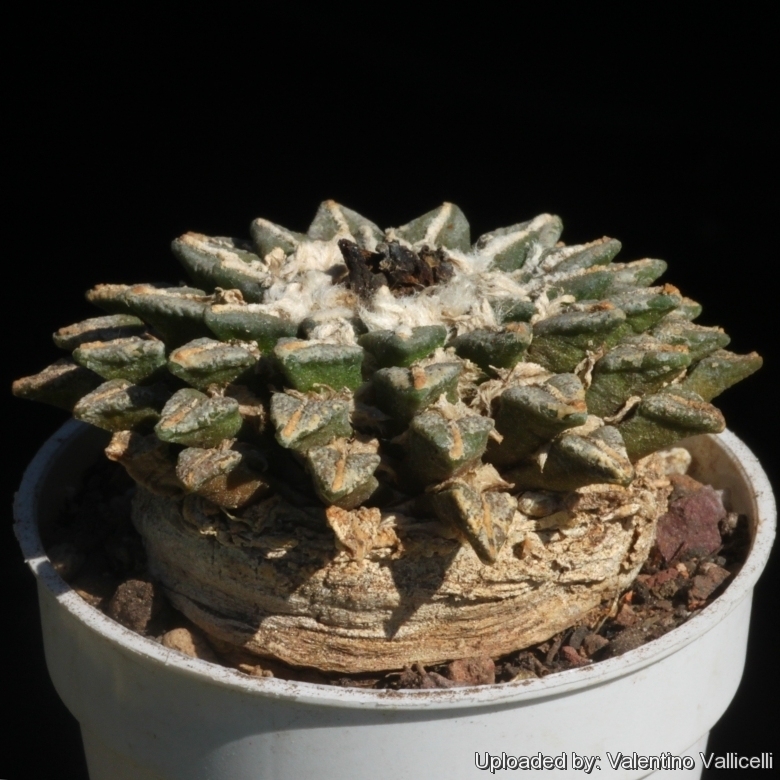 In times of severe drought the whole above-ground portion of these plants can shrink and be covered by mould, but the taproot remains alive. The main threats to this species are human settlements, waste dumps, illegal collecting, and local medicinal uses. Some localities have been partly depleted by illegal collectors. 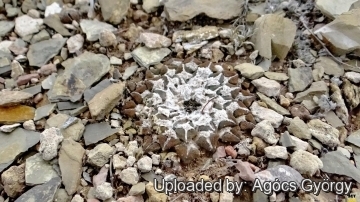 Description: Ariocarpus kotschoubeyanus are very flat geophyte cacti that produce small star-shaped rosettes. They in most cases don't reach more than only a few centimetres above the ground. 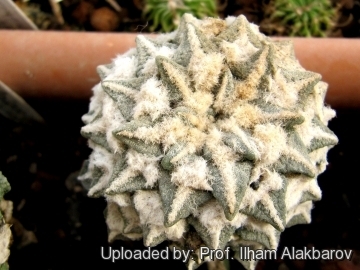 Although they can form clumps, often only a small disc of tubercles can be seen flat at the soil surface, however these plants grow a large tap root below the surface of the compost. 5) Gómez-Hinostrosa, C., Sotomayor, M., Hernández, H.M. & Smith, M. 2013. 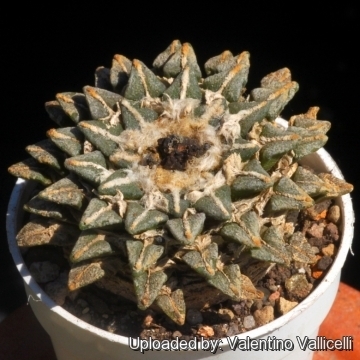 Ariocarpus kotschoubeyanus. In: IUCN 2013. IUCN Red List of Threatened Species. Version 2013.2. <www.iucnredlist.org>. Downloaded on 18 February 2014. Cultivation and Propagation: The plants need deep pots to accommodate the napiform unit formed by the stem base and the rootstock, and a loose mineral soil with a well-drained substrate. They need a good amount of light, a place near the roof of the greenhouse helps drying the pot after watering. This can be done weekly during summertime, if the weather is sunny enough, with a little fertilizer added. Kept this way, plants will show a healthy, although slow growth. They are frost hardy to -10°C.